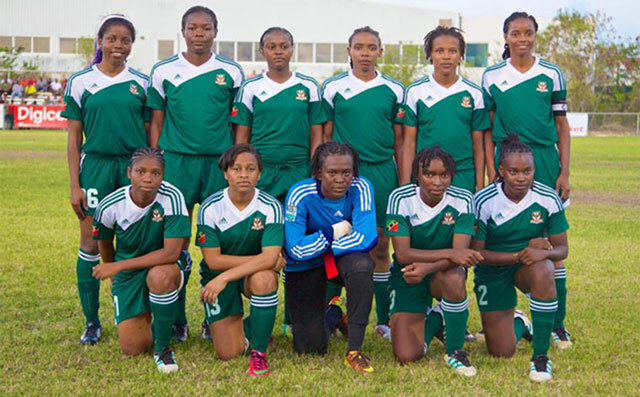 Basseterre, St. Kitts-The female football program in St. Kitts and Nevis is expected to undergo another phase of growth in 2017 as various age groups will be competing. The Females National U17, U20 and senior teams are slated to participate in various world cup qualification throughout the year and speaking with The Observer Technical Director of the SKNFA Lenny Lake called for a tempering of expectation in these competitions. “The female program is still in its grass roots stage and I get a lot of criticism from a lot of people comparing it to the male. The male have been around for many years and they have been tremendous investment in the male footballers. Female footballers was started in the last six to seven years and that is really young,” he said. Mr. Lake said there is a lot of work still to be done in female football and one major of their challenges is the fear of women being labejled lesbians as well as a stigma from parents. “Some parents think that girls should not play football and we still have challenges where the female stigmatise it as a lesbian type sport and I believe it is far from the truth,” he declared. He said there are more young girls getting involved and that way of thinking is slowly being laid to rest. “But we have to keep working on changing the mind-set of players that it is ok to play football and young girls can play and enjoy the benefits of the game,” he stated. Lake disclosed that at the moment they do not boast of a large pool of female players and makes it challenging to build a proper programme. “It below 500 and that is a small pool to have a U17, U20 and a senior team of quality so we have to find ways to increase the participation which we have been doing,” he said. He then reiterated the need for attention on developing the program. “We are not going to get quality girl players by just sitting down and asking them to play. I am sure that once we continue with that effort and continue providing the opportunity in 5-10 years we will begin to see the fruits of our labor,” he said. “We are hoping when they enter and get the experience we hope that they could learn more and so that at the senior level we have better players,” he said. He added that lessons learned in the upcoming competitions are more important than the results. “To tell you we are going to produce good group of players in the U20 or U16 is unfair and unrealistic but to say we are going to participate and learn from the experiences we are going to gain is more realistic,” he concluded.